Josie d'Arby follows a Christmas tree from forest to local church, and a minister reveals how God helps him cope with cancer. Browse content similar to Preparing for Christmas. Check below for episodes and series from the same categories and more! and they've even got reindeer! in the middle of our community at this time of year. is not wrecked, by the circumstances of my life. ..and why JB Gill is giving blood this Christmas. and we begin in Manchester with a carol written for the Advent season. And for a real treat, it's accompanied by a full orchestra. for delivery to homes and communities. Lester, how many trees do you have here? -About 40,000 spread over two sites. -Wow! How much land is that? I know you also have reindeer here, which is so charming. Where do they fit into the picture? required to look after them. So definitely the star of the show. Helen and Lester believe they were guided by God to take on this farm. both not local to here, we were in Dorset, and had both well-paid jobs. because you can't easily make a living off of 25 acres. So how did you approach this dilemma? We did go back and pray about it quite a lot, didn't we? We did, and then we got a phone call. It was offering us work in the West Country. we should be taking, however mad it seemed at the time. the honour of selecting the tree being donated to their church. What is the meaning of Christmas for you two? It's all about rebirth and starting again, isn't it? It's always a time of wonder as well for us. It's a time of excitement, I suppose, as well, isn't it? to us is just the rock, really, on which we now try and base our life. the modern hymn Christ Be Our Light. you'll be starting to wonder about gifts for family and friends. all to give a very different present through becoming a blood donor. The campaign is inspired by the organisation behind the MOBO Awards. JB Gill has been finding out more. I've been lucky enough to win five MOBOs with my band, JLS. the MOBOs run important social campaigns. This year, they're encouraging people to give blood. I'm doing my bit. I'm about to give blood for the first time. -Yeah, it's not too bad, is it? in particular from the black and Asian communities. There we go. That's going fine. -If you get any pain, just let me know. and use this to get that crucial message out there. MOBO and NHS are creating a choir to spread the word. It's called the B Positive Choir. give is the gift of lifeblood that others really do need. the whole time on dialysis, I needed a lot of transfusions. I needed transfusions just to get up and walk around the house. enjoy something compassionate about it at the same time, it's fantastic. mind-set can help kind of change your life in many different ways. Some people feel better, like they're regenerating themselves. Some people do feel better afterwards. Well, I'm regenerating myself and somebody else. What better gift to give at Christmas? What a nice reason to put a choir together. Perhaps many more will give blood as a result. the redeeming work of Christ on the cross in his song called How Far. # How far is it to Bethlehem? # Where hope was born? including, of course, the lighting of Advent candles. The Reverend Rose Hudson-Wilkin explains what they symbolise. as a reminder of the Patriarchs - the men and women of old. They were courageous and they were faithful. The second candle is a reminder of the Prophets. to the people, whether the people wanted to hear it or not! the Baptist - the forerunner of our Lord, Jesus Christ. On the fourth Sunday, Mary, the mother of Jesus. and dwelling in our midst - possible. and so we light it to represent Jesus Christ in our midst. The incarnation is now a reality. it's also a poignant moment to reflect. and the church's growth has been a success story. and that it was spreading. because I didn't really feel that unwell. So it was a huge, devastating blow. the tumours in my liver. some divine inspiration in the form of lyrics to a new song. I was quite scared, really. I didn't know what was going on and I wasn't feeling good at all. and they were the beginning of the song that I wrote. a video, which has now had thousands of views online around the world. an opportunity to share my faith in Christ and to declare who Jesus is. that I can still be used by God in that way. together as often as they can. and that is very different from happiness. not impacted, is not wrecked, by the circumstances of my life. # Joy to the world! but his positivity continues to inspire family and friends. deeply moved by what's happening. and that we can have him for as long as is possible to have him. We just really want to stand with Andrew. he's going, but we are concerned about what he's going through. then we wouldn't be here this evening. We're just going to treat this like any other Christmas. It's going to be special, as always. Yeah, we'll just treasure it like we always do. or the lighting of a candle transforms that darkness. that has transformed the darkness. I've known his light at work in my life. Helen and Lester Bowker here in Devon. to give to their local church. It'll have pride of place in St Mary's in the village of Whimple. I'm helping the Sunday school to get it decorated. in Europe, Africa and Asia who'd otherwise receive no presents. because sometimes it can get really cold. I've got toothbrushes, some sweeties. Because children around the world, they don't have a lot of things. That we give things to them, we're, like, all the same. organises the collection of the shoe boxes. We're talking 12 million boxes worldwide. 850,000 boxes from the UK. it's each individual box goes to an individual child. and such a joyful thing. the greatest gift that we could have received. "What can I do to help other people?" being used to help bring Christmas joy in their village and beyond. stage in the middle of our community at this time of the year. and understand the true meaning of Christmas. Well, that's almost it from our Advent journey. Next week, we'll be exploring Winchester's Christmas Market. of our very own Songs Of Praise presenters. which goes right to the heart of the Christian faith. 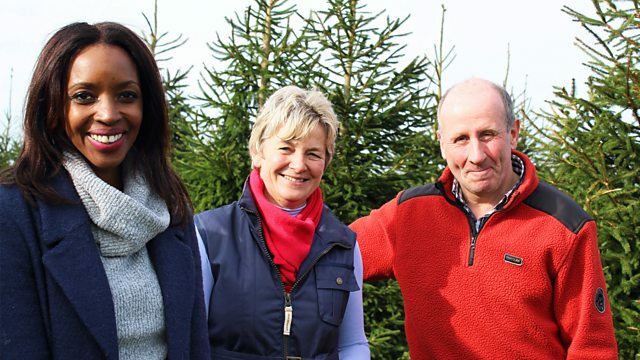 Josie d'Arby celebrates Advent by following the journey of a Christmas tree from a Devon forest to a village church, while its farmers share their own deeply held Christian faith. In Plymouth, a church minister with cancer describes how God is helping him look forward to Christmas. JB Gill meets B Positive, a new choir founded by the MOBO Awards and the NHS to encourage people from all different backgrounds to give blood, and he donates his own for the first time. Songwriter Matt Redman performs a Christmas song - How Far, while the Hereford Cathedral Choristers sing The Truth from Above. Plus there are hymns and carols both old and new, including Hills of the North Rejoice, Christ Be Our Light, O Come O Come Emmanuel, Here I Am to Worship and The First Nowell. Hills of the North Rejoice led by BBC Philharmonic with Huddersfield Choral Society Christ Be Our Light sung in St Patrick's Church, Dungannon How Far, written and performed by Matt Redman O Come O Come Emmanuel sung in Hereford Cathedral Here I Am to Worship led by Noel Robinson at Church of Christ the Cornerstone, Milton Keynes This Is the Truth Sent from Above performed by Hereford Cathedral Choristers The First Nowell sung in Romsey Abbey.